Healthy Future was started with a simple dream to live as chemical free as possible. After making all natural products, Elizabeth finally realized that maybe others felt like her but did not have time to make their own chemical free products. 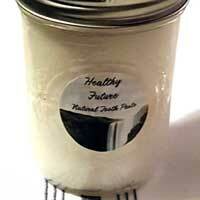 All Healthy Future products are not only all natural, but also simple and basic. The goal of Healthy Future is to create pure and all natural household cleaning products and personal care products including All Natural Laundry Detergent, All Natural Fabric Softener, and All Natural Toothpaste. 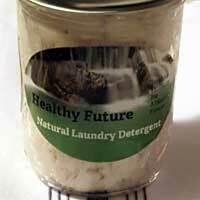 The All Natural Laundry Detergent is made with baking soda, lemon juice, white vinegar and essential oils. 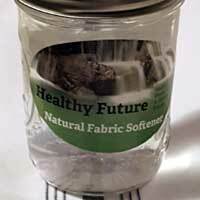 The All Natural Fabric Softener is made with white vinegar, water, and essential oils. The All Natural Toothpaste is made with baking soda, coconut oil, and mint oils. By using chemical free, all natural products you can protect your skin, clothes, and Mother Nature. Conventional cleaning products and personal care products are loaded with all kinds of ingredients, including chemicals, that we should be very wary of using and washing our clothes in. Clothes we then wear against our skin, which those chemicals can be absorbed into our bodies.